Well, well, well…. Stop the presses. I’m VERY critical of salsas for many reasons. 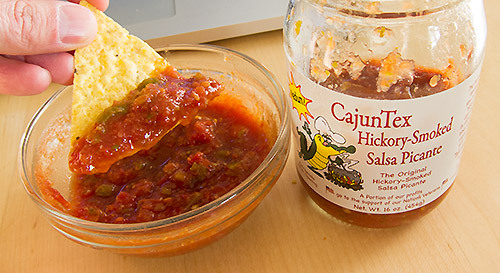 CajunTex Hickory-Smoked Salsa Picante is not one of them! First, I can’t stand cilantro. Typically when I receive a product sample with cilantro in it, I give it away. I’m one of the few people who have the “cilantro gene.” There is actually a genetic study which concludes that a percentage of the human population actually believes cilantro tastes like soap. Even the slightest cilantro typically causes a big reaction in my mouth, and it is not a good one. Despite having cilantro though, this salsa is fantastic. I can’t taste the cilantro. Now, not tasting cilantro isn’t exactly the only way of grading a salsa. I need some kick, and some flavor. This salsa has some great sweetness and thickness to it. Even better, this “medium” salsa has a heck of a kick. I can’t wait to try the hot version. Finally, a portion of the profits from sales of this salsa go to support our nation’s veterans. Another great way to use salsa is to cook fish in it! I get a white fish, like tilapia, and cook it in a bit of beuttr, garlic, and white wine for a few minutes, then pour salsa over top and let it cook the rest of the way through. It’s a great healthy and quick dinner served with veggies and brown rice or quinoa.